Candidates those have given the examination on 3rd June can download the Results, merit list, score card from the official portal, jipmer.edu.in. Candidates can go through the article for more details regarding the JIPMER 2018 Results. A press note Released by JIPMER says that JIPMER result 2018 of MBBS entrance exam were announced here on 9th June. The results were originally scheduled for June 20 release but as usual, the Institute administration did so 10 days ahead, without any prior notice. The Jawaharlal Institute of Postgraduate Medical Education and Research is one of the most established institutions that offer various medical courses for aspirants. The JIPMER will offer admission by organizing the entrance test for aspirants seeking admission in it. The JIPMER offers various UG, PG, Super specialty, fellowship, Diploma, certificate, Ph.D courses in medicine. Annually huge number of aspirants shows interest in getting the seat in JIPMER. The competitors who performed well in the entrance test will get admission. The JIPMER has organized MBBS Entrance test on 3rd June for contenders who are seeking to get admission into the course. All the candidates can estimate their score in the test by downloading the JIPMER MBBS Answer Key 2018. The JIPMER MBBS Results has been out now and everybody is feels free after checking the result. The JIPMER MBBS results and cutoff marks announced. Students have to maintain some patience until the JIPMER announces the result date. Hopefuls can Check on JIPMER result, cutoff marks, and counselling dates 2018 with candidates details login at official website. The list of certificates to be brought on the day of counselling (Ref: Prospectus Page No.29) All applicants who have appeared for the entrance Examination can download their individual Rank Letter detailing their marks from official website of JIPMER ( www.jipmer.puduchery.gov.in/ www.jipmer.edu.in) from 12.06.2018 (Tuesday) from 11.00 AM No individual communication will be sent to any of the candidates The candidates are required to check the JIPMER website for relevant and updated instructions on counselling periodically. Change of Counselling date will NOT be allowed to any candidate under any circumstances. How to check JIPMER MBBS Results 2018 at jipmer.edu.in? Search for ‘MBBS Result 2018’ Link on the homepage. Click on it and enter the details of registration number, password etc details and finally click on ‘Submit’ button to download the Results. 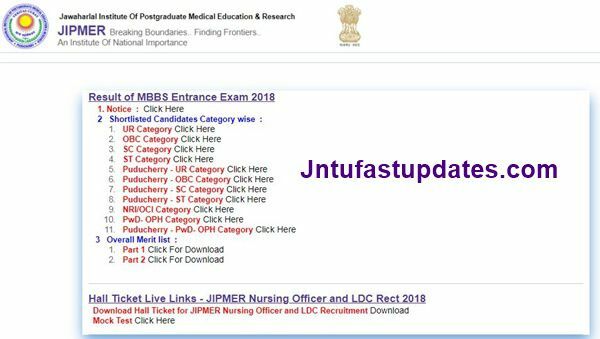 1.2 How to check JIPMER MBBS Results 2018 at jipmer.edu.in?